Prizes: 100 x Real Madrid Live at the Santiago Bernabeu Stadium, Spain. 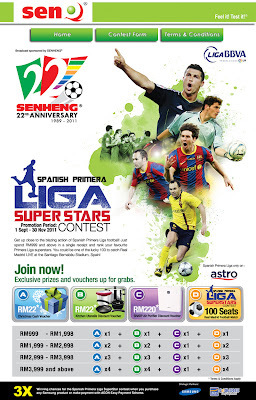 Spend RM999 and above in a single receipt & rank your favourite Primera Liga superstars. 3x winning chances when you purchase any Samsung products or make payment with AEON Easy Payment Scheme.